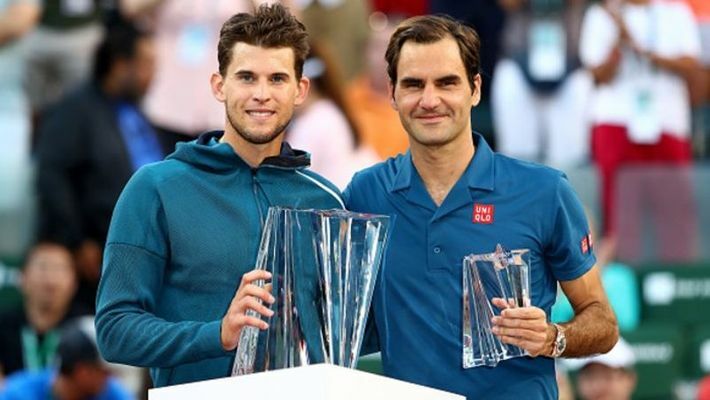 Indian Wells: Dominic Thiem rallied from a set down to stun Roger Federer 3-6, 6-3, 7-5 in the final to win the ATP Masters 1000 title in Indian Wells on Sunday. This was Thiem's first ATP Masters trophy after failing twice in finals in Madrid. The 25-year-old Austrian denied the Swiss great his sixth Indian Wells crown, coming back in fine fashion after losing the first set 3-6. Thiem won the match in two hours and two minutes. Thiem is the first Austrian to win a Masters 1000 title since 1997 when Thomas Muster achieved the feat in Miami. For the second consecutive year, Federer failed to clear the final hurdle in Indian Wells. In 2018, he was defeated by Argentina's Juan Martin del Potro after squandering three match points. "It's unreal. It's a pleasure to compete against Roger in this great final. I lost my last two Masters 1000 finals, but I won this one and it feels as nice as a Grand Slam," Thiem said after the win. "It was a great week and I think also a very good final today. Just amazing that I got here, my first really big title. I came from a really bad form in all categories and now I'm the champion of Indian Wells. It feels not real at all. "I was in the zone the whole match. I had to get used to Roger's game. In the first set he was playing amazing. It was completely different from my opponents before him. I was struggling to work my way into the match. I had to fight to save those break points early in the second set. It was a very good match until the end and I had to fight to serve it out," he added. After the loss, Federer said it was a great week for him and added that Thiem deserved the title. "It has been a great week for me, even though it didn't work out. Congratulations to Dominic, wonderful week and great play at the end. You deserved it," the Swiss great, who recently won his 100th career title in Dubai, said.